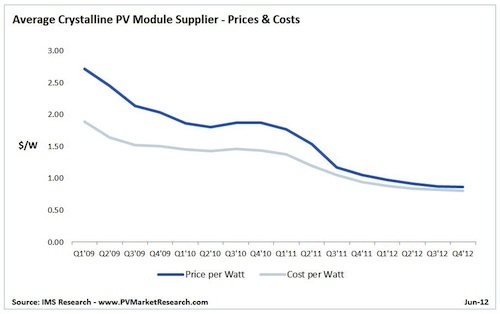 The costs of solar PV (solar panels) are continuing to drop dramatically. Under intense pricing competition in the solar industry, struggling solar panel manufacturers worldwide are having to find ways to cut costs, REneweconomy reports. The costs of manufacture are set to fall a whopping 30 percent in the 2012 calendar year alone, and that’s after a drop of 75 percent over the past 2 years. While not great news for many struggling solar companies, this is certainly good news for people buying and installing solar panels. The point is well made by Giles Parkinson, that if you have seen any news about the solar industry lately, most of it tends to focus on the ongoing price war, struggling solar manufacturing companies, company bankruptcies, and lawsuits. The headlines don’t mention that during all this, solar panels prices have continued to fall dramatically. For the end buyer of solar panels, “everything else is peripheral”. In the struggle to survive brutal competition, solar manufacturers are finding ways to improve efficiencies, innovate, and invest funds in further development. If they don’t, they will certainly not survive in this emerging industry. To my mind, the situation is reminiscent of how in many new industries early on, including in the early car industry, many companies start-up but as time goes by, many struggle and eventually collapse or get bought out by other players. Just because many companies are currently in trouble, and many have fallen over, it doesn’t mean solar power is not growing significantly. In fact, as we know, it’s growing exponentially, but you wouldn’t know it from most of the headlines. Perhaps it’s possible that some of the companies that survive this major solar industry shakeout will thrive later down the line, given the exponential growth of solar power in general. And then there’s that whole climate change thing that’s still being largely ignored. It will no doubt drive huge growth in clean energy over coming years. What do you think?